A lay figure by Albrecht Dürer in the Prado Museum. 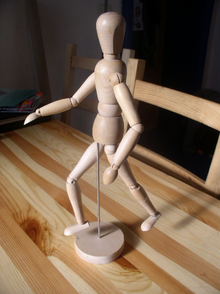 Historically, artists have often used articulated mannequins, sometimes known as lay figures, as an aid in drawing draped figures. The advantage of this is that clothing or drapery arranged on a mannequin may be kept immobile for far longer than would be possible by using a living model. 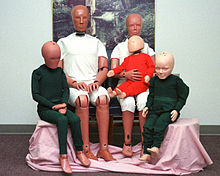 In first aid courses, manikins may be used to demonstrate methods of giving first aid (e.g., resuscitation). Fire and coastguard services use mannequins to practice life-saving procedures. The mannequins have similar weight distribution to a human. Special obese mannequins and horse mannequins have also been made for similar purposes. Mannequins were a frequent motif in the works many early 20th-century artists, notably the Metaphysical painters Giorgio de Chirico, Alberto Savinio and Carlo Carrà. Shop windows displaying mannequins were a frequent photographic subject for Eugene Atget. 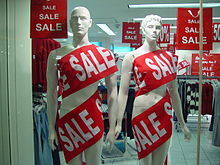 Mannequins are a common theme in horror fiction. Many people find mannequins disturbing (due in part perhaps to the uncanny valley effect), especially when not fully assembled. In the Doctor Who serial Spearhead from Space (1970), an alien intelligence attempts to take over Earth with killer plastic mannequins called Autons. Mannequins come to life and attack the living in "The Trevi Collection" (episode 14 of the television series Kolchak: The Night Stalker). Abandoned nuclear test sites consisting of entire towns populated by mannequins appear in such films as Kalifornia (1993), Mulholland Falls (1996), and the remake of The Hills Have Eyes (2006). The romantic comedy film Mannequin (1987) is a story of a window dresser (played by Andrew McCarthy) who falls in love with a mannequin that comes to life (played by Kim Cattrall). The cast of the satirical Japanese television series The Fuccons/Oh! Mikey consists entirely of inanimate mannequins with voices dubbed in. The music video for the hit single "The Sun Always Shines on T.V." by a-ha features the band performing in a church full of mannequins. ^ Cooper Jeffery B, Taqueti VR (December 2008). "A brief history of the development of mannequin simulators for clinical education and training". Postgrad Med J. 84 (997): 563–570. doi:10.1136/qshc.2004.009886. PMC 1765785. PMID 19103813. Retrieved 2011-05-24. Look up mannequin in Wiktionary, the free dictionary.